A couple weeks ago, members of our team attended the Michigan International Women's Show! We had so much fun doing tie dye and crafty workshops. One of which we want to share with you today. 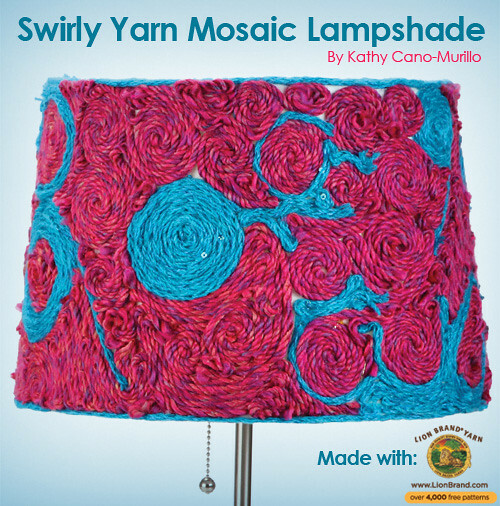 It's a Swirly Yarn Mosaic Lampshade by Kathy Cano-Murillo a.k.a. Crafty Chica. Lion Brand was so generous and sent us a ton of beautiful and rich yarn skeins for attendees to make the project with! The colors were so vibrant and some even had variegated tones. So pretty...here's a closeup of one of the lampshades! 1. Cut a few strands of yarn, about 12" long each. 2. Start with one section of the lampshade, about 4" square. Apply a medium amount of Fabric Fusion® and spread evenly with the craft stick. 3. Starting with the end of one of the pieces of yarn, press in place in the wet adhesive and wrap the yarn around in layers to create a circle design. 4. If you like, you can create a swirl effect by having one strand branch out into another circle. Continue adding adhesive and yarn until the lampshade is covered. 5. You’ll have some empty areas and that’s fine! Simply snip small pieces of yarn and press to fill in. 6. Add a line of adhesive along the top ridge of the shade and add yarn. 7. Repeat for the bottom of the shade. This will give it a polished, professional look. TIPS: Instead of circles, apply yarn in square or rectangular designs. Clean hands with baby wipes to remove glue from your fingers. Here's an in action pic of the project being done at the show! You can use any color of Lion Brand Yarn that tickles your fancy! Play with different colors to match your room. So much fun! 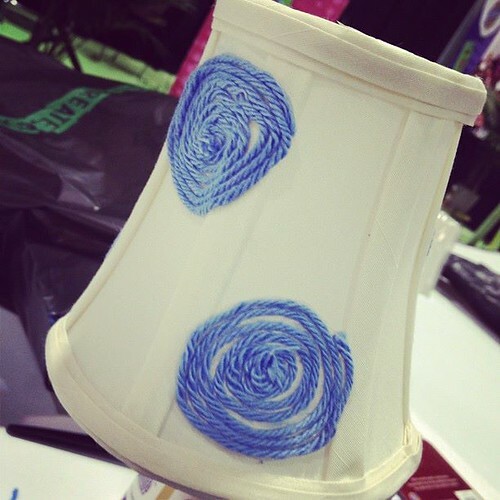 What colors of yarn would you use to make your customized lampshade? We are producing 100% cotton yarn of several counts ranging from 10/s up to 40/s for knitting and weaving.